One of my goal poses (not to be confused with fear pose) in yoga is to be able to hold a headstand. With my fear pose(s) it’s often over-thinking that holds me back from, with goal pose(s) I’ve given it lots of thought … I just haven’t gotten quite there yet. Headstands are one of those poses that I’ve always been surrounded by but often forget about practicing it myself. I always remember when my Dad and step-mom introduced yoga to my high school my senior year (soooo glad it wasn’t freshman) and while my step-mom was guiding us through one thing or another, my dad silently extended in to headstand slowly catching the awe of everyone in the room – for me it was just dad being dad. He’s 6’6″ so it made for quite an impressive site. When I taught children, they would happily flip into headstand – often a little too quickly. I’ve done plenty of donkey kicks myself and taught many. But the strength in headstands comes from the control. Control takes a little more concentration. So I’m trying to pay attention to certain steps and poses in my current classes that can help me gain that control and strength (looking at you core). 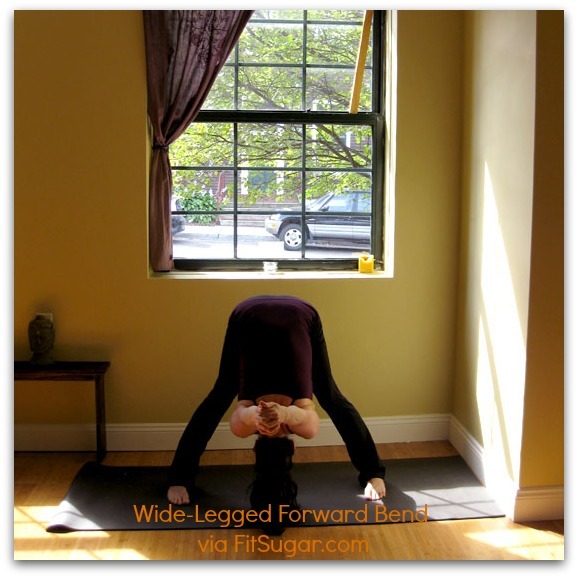 My favorite yoga class has included a wide-legged forward bend in almost each one since I’ve been practicing in April. Looks simple enough – my hamstrings tell me otherwise. My head is not on the ground. Not even close. But through the guidance of the instructor, I’ve really tried to be more mindful of the pose. It’s getting there! Slowly but surely. 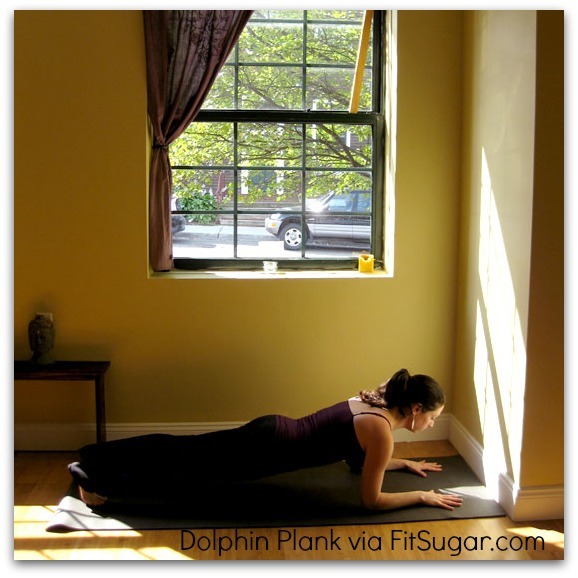 Another pose that is a huge support is not just plank but Dolphin Plank and with babysteps, inching my feet forward. This is part strength and trust, as my feet move closer to the front my trust needs to build in the strength of my arms for the foundation of my headstand. What I should be doing, is practicing at home – and this would be an excellent way to do so (not really an option at the gym). Headstand : challenge or child’s play? Categories: Yoga | Tags: dad, Fit Sugar, goal pose, headstand, headstands, Reflections from the Mat, related links, Yoga, yoga class, yoga links, yoga pose, yoga practice, Yoga Tips, your turn | Permalink. Not everyone likes a hands on yoga teacher. I love it. Sometimes it can be a little nerve-wracking, you’re already shaking in the pose and you see the teacher making her way over and all you can think is “I can’t reach my toes / my arm is extending as high as it can / my heart is as open as it’ll ever be / yoga is torture “ (and if something doesn’t feel right then you should definitely speak up!). Other times a little helping hand can open you to a pose in a whole new way. But mostly for me it’s the little touches. 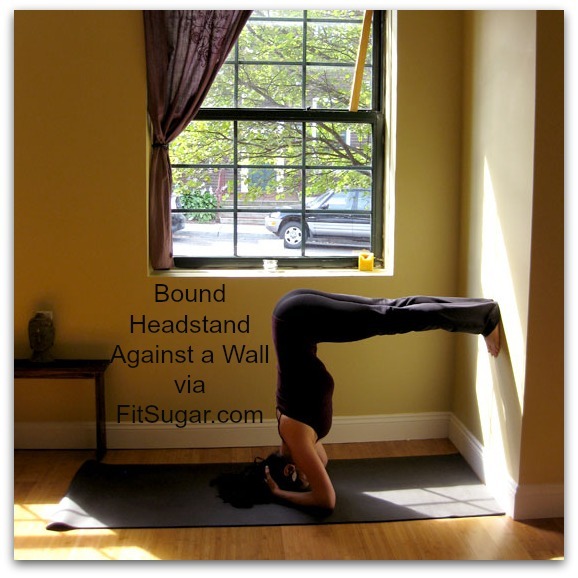 Helping you to further release into downward dog or child’s pose. Adding weight to you shoulders (and if you’re anything like me they’re permanently glued to my ears) in savasana. Perhaps it’s growing up with a dad who would teach me some basic poses to deal with heavy backpack aches and getting the one-on-one attention. Or may it was growing up massage therapy and later physical therapy. Definitely the influence of being around yoga teachers and becoming one myself to children. I even took the practice of rubbing lotion on the kids feet which was something I picked up from my yoga teacher mentor & stepmother. Ok maybe not when I taught at the camp. Ps. have you seen children’s feet during the summer after a morning full of camp and beach to come to the yoga studio? Do you like hands-on teachers or see it as an invasion of space? Categories: Yoga | Tags: family influence, greys anatomy, Massage, Reflections from the Mat, savasana, Yoga, yoga class, yoga teacher, yoga teachers, your turn | Permalink.